What a week it has been for WEEI. The popular sports talk radio station had to suspend a host. At least five advertisers cut ties to protest a pattern of offensive behavior on air. And by the time Friday rolls around, the station will halt live programming for the day so employees can attend mandatory sensitivity training. I started the week seething about WEEI and its shock-jock antics, but I end it hopeful that there will be real change at the station. After a week of radio silence, we finally heard from Mark Hannon, the Entercom Communications executive in charge of WEEI and the local market. “Nothing is more important to WEEI than the close-knit and diverse Boston community we call home, and we are committed to actively contributing to its betterment,” Hannon said in a statement on Wednesday. Entercom, WEEI’s owner and one of the biggest radio companies in the country, is condoning a culture of hate and acceptance of the unacceptable. What the station is doing Friday is unprecedented: suspending live programming from 6 a.m. to 6 p.m. so as many employees as possible can participate in the training. Admittedly, it’s hard for me to picture morning show hosts Kirk Minihane and Gerry Callahan sitting through the daylong session without sneering, but hope springs eternal. This will be at least the second time Callahan has been put through sensitivity training. In 2003, he compared an escaped gorilla from Franklin Park Zoo to a METCO student “heading out to Lexington.” Students in the METCO program are predominantly black. Callahan was suspended for two weeks. Some of you may think my end goal all along was to have bad-behaving hosts fired. Not true. That’s not how you change the culture of the place. Hosts can come and go, but management needs to get it. And I get the sense that Hannon — who took the reins of WEEI last fall after Entercom’s merger with CBS Radio — is taking the advertiser and community backlash seriously. On Monday, I went off on midday host Christian Fauria after he mocked well-known sports agent Don Yee in a stereotypical Asian accent last week. Like me, Yee is of Chinese descent, was born in the United States, and speaks English without an accent. Fauria got suspended; he apologized. Can’t we just move on? I couldn’t, and not just because I was personally offended. WEEI’s frequently boorish, sometimes vile commentary creates a toxic feedback loop. It no longer becomes a bunch of guys mouthing off in front of a microphone but promotes a culture of vitriol. I experienced that firsthand in hateful tweets and e-mails sent by WEEI listeners all week long. If they’re doing it to me, they’re doing to others, too. It’s early innings in terms of real change at WEEI. The sensitivity training is a great start, but breaking bad habits will take time. In addition to the seminar, I hope hosts and producers get out into the communities they have disparaged so both sides can better understand each other. In my Monday column, I called on Fauria and his cohosts Glenn Ordway and Lou Merloni to attend an event in Chinatown and play the audio of Fauria’s impersonation. I wanted them to look into the eyes of Asian-Americans and hear firsthand how hurtful the joke is. Just say the word, and I’ll make the arrangements. But what made WEEI an uncomfortable place to work this week was the pressure from advertisers who realized shock-jock antics may be good for ratings but nothing else. They sent a message loud and clear, led by Citizens Bank, Comcast, City of Boston Credit Union, Massachusetts State Lottery, and Massachusetts Health Connector. All of them suspended or terminated commercial buys this week to protest a pattern of offensive behavior. Advertisers must keep up the pressure, so must the sports teams that have partnerships with WEEI. That would be the Patriots and the Red Sox. Tom Brady criticized WEEI after fill-in host Alex Reimer disparaged the Patriots’ star’s 5-year-old daughter. Brady even cut short his contractually obligated interview in the week leading into the Super Bowl and has said he is reassessing his relationship with the station. Reimer has been suspended indefinitely. 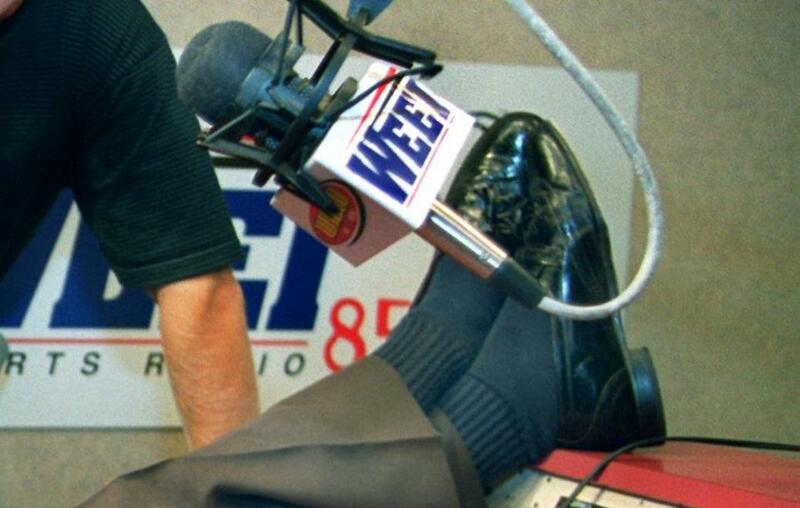 To hear Sox president Sam Kennedy tell it, he has been giving WEEI management an earful since last year about offensive on-air content, conversations that have gone all the way to the top of Entercom with CEO David Field. “It is very troubling when you have an affiliation with a station that has consistent controversies, and unacceptable and offensive dialogue,” said Kennedy. Kennedy said the sensitivity training was a step in the right direction — and overdue. “It’s a very good thing for Entercom and WEEI to take a long, hard look at what is acceptable to them and what is not, and to make it very clear to their on-air talent,” he said. The Red Sox say they want a change. A lot of us do. Let’s hope we will finally get it.